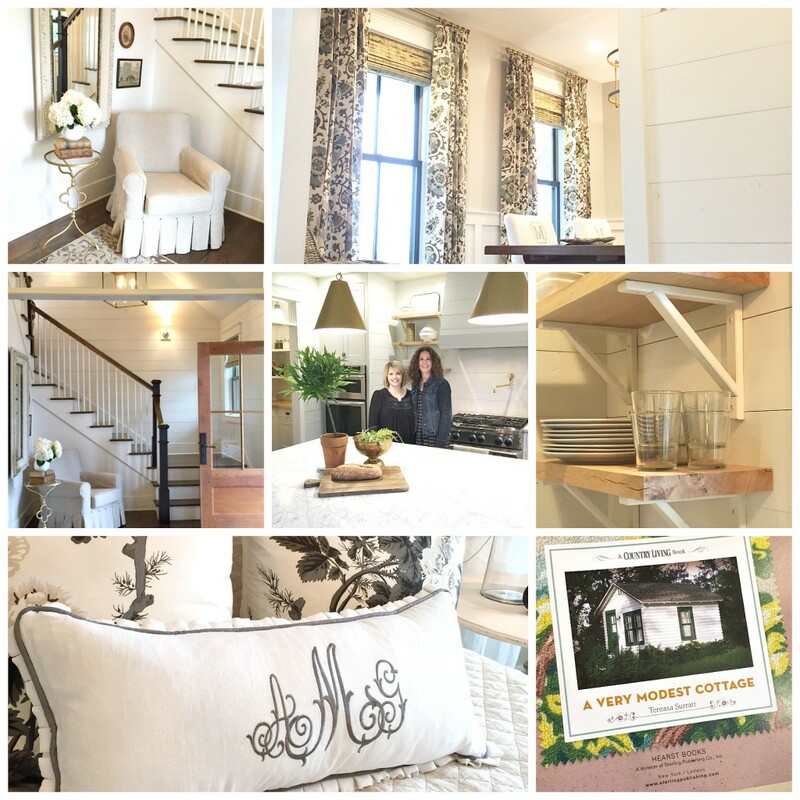 The My Next Home parade home is open in Eau Claire, Wisconsin! For times and ticket info visit here. I arrived last Wed and helped style and prep things…meaning make multiple Target and TJ Maxx and Joann runs..and spray paint and rub n’buff etc. A lot of work but yes a lot of fun too!…12-14 hr days..the crews and cleaning people worked longer! But it is all worth it! Saturday at ten am we opened our doors and it was such fun to see people’s warm reactions to the farmhouse in town! One thing I love about this house is that so much is custom or handmade but so much is also big box and easily accessible like the PB rug and sofa in the room above. Sure the chairs and windmill on wall were rare thrift finds from Craigslist for bargains and nothing makes a room special more than a piece of old wood or antique but the basic good sofa and blinds from select blinds are no brainers/easy orders! 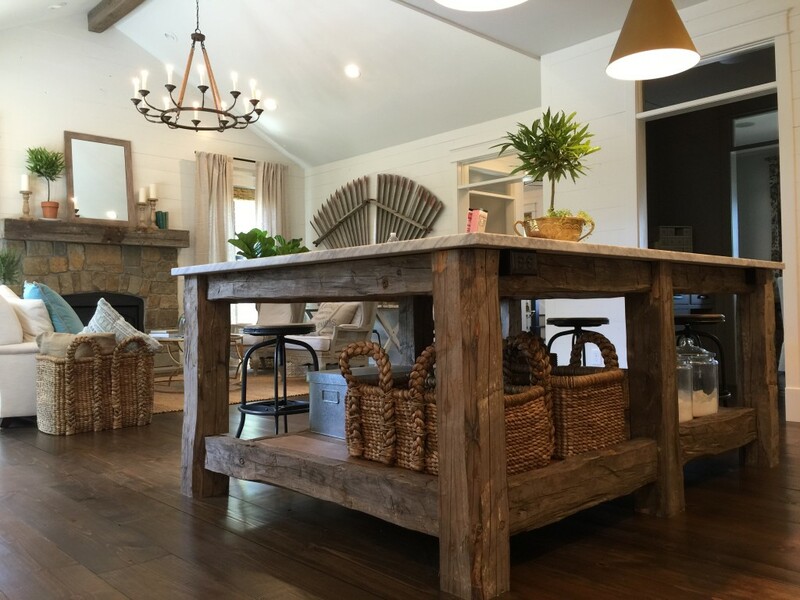 Proves not every single thing has to be custom (100 year old barn beams retrofitted for an island or in your ceiling) sometimes a basic sisal rug or white bracket from lowes are okay and fitting. The power is in the mix! 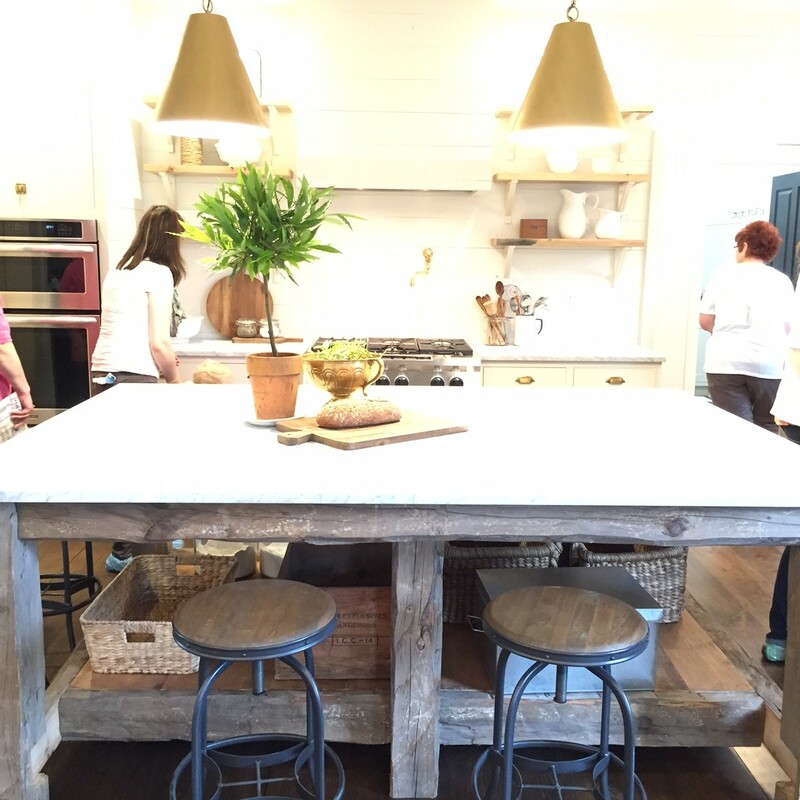 Case in point, Ballard pendants over marble custom island! 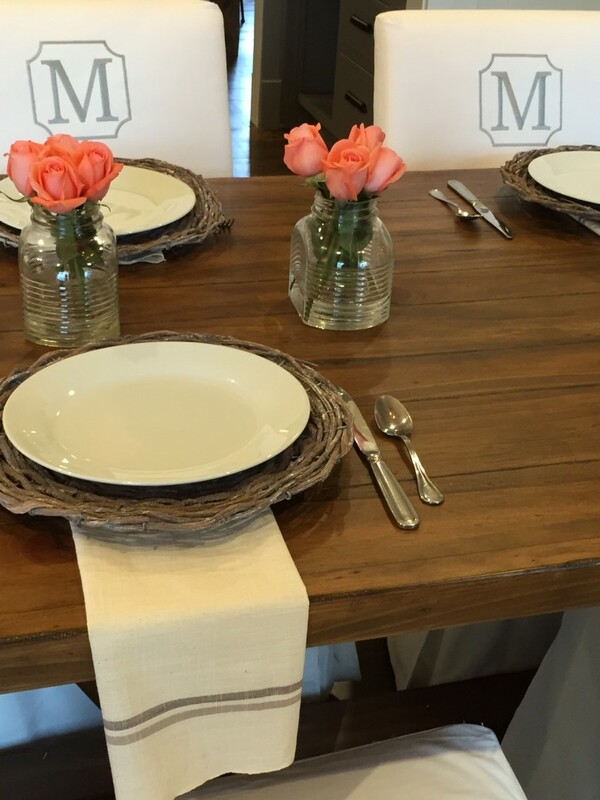 And again below, the monogrammed slips are from Ikea and the table from Pottery Barn. The team at My Next Home could have made a craftsmen table but they had enough to do on the actual house so we purchased the table which is okay in my “its all in the mix” thinking because the room has custom drapes and an antique gray blue sideboard to give interest and make unique! 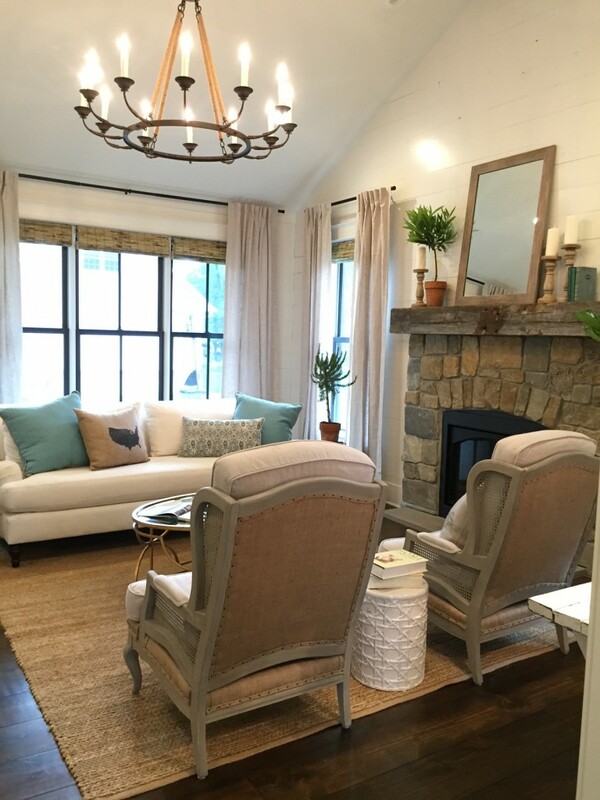 Allison, the builder’s wife and homeowner, redid these chairs below…those of you that follow me on instagram you saw the before and during Light is from Ballard and coffeetable from TJMaxx. Down to Earth Garden Center provided the plants…so gorgeous. 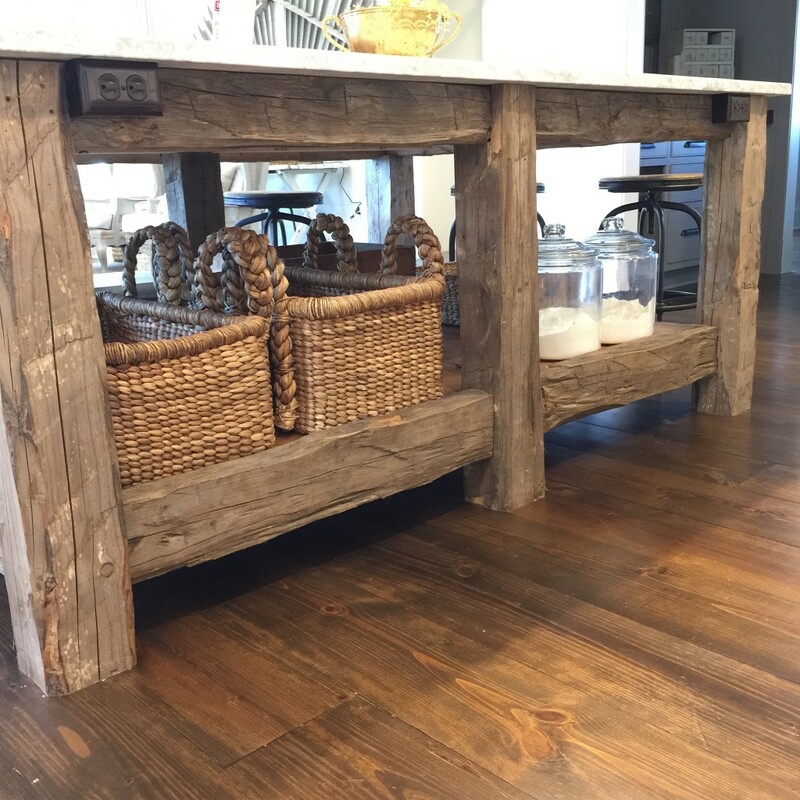 Close up of the wood on the island..i love how she placed the outlets! 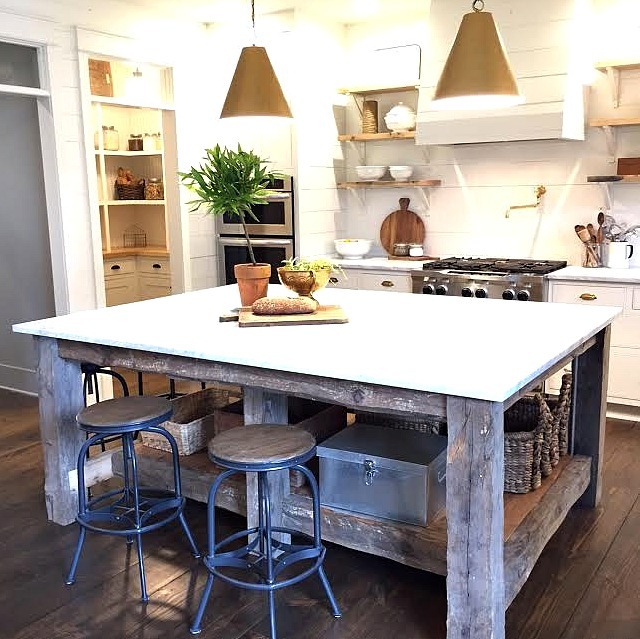 The warmth of the stain on the new Southern long leaf pine floors and wood of beam and island really keep the white walls from being cold. Essential in Wisconsin..they need cozy y’all! And unlike on HGTV and many high end show homes, NOT everything was even finished, but despite that it looks amazing, like home! Seriously it looked and felt about were about to uncork some wine and have dinner! Mission accomplished! 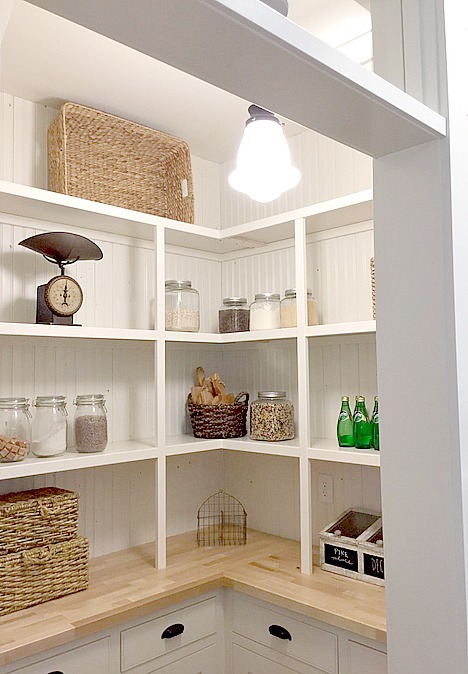 A look into that pantry…it feels like a drugstore or candy store, love Allison’svision for exactly how she wanted the shelving. 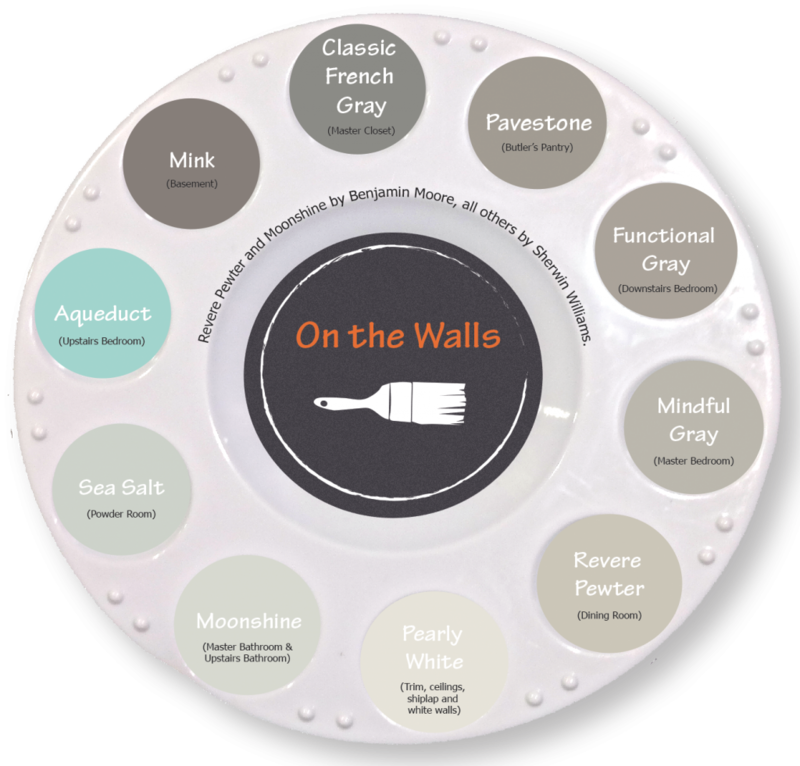 Also the counters for laundry, kitchen and butlers are all different! There is also a vintage light in the pantry. The house is a mixture of vintage, antique and reproduction lights that all work together to give a cozy, collected feel. All of the shiplap, beadboard and most of the sheetrock in the house is SW Pearly White. Looking from sink into the laundry. I love this view from back door to master..again TRANSOMS! LIGHTS! PEARLY WHITE PAINT! 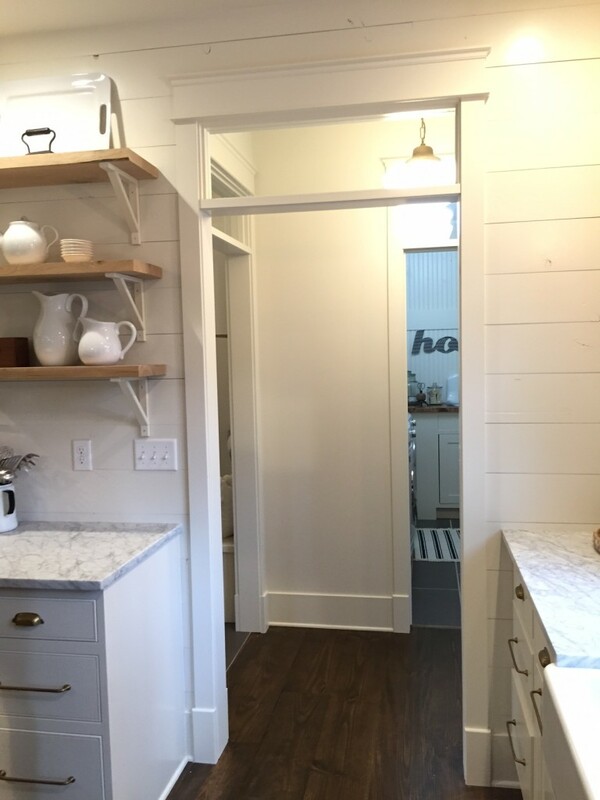 In the master we used shiplap on the ceiling not walls. Miss Mustard Seed paint in schloss on the bed and dresser! Wood windows painted black, looks like steel doors but not! And of course some monogramming on the bed! And schumacher hollyhock…i love this bedding mix…PB and other big box bedding mixed with jsut a few custom pillows! Behind the bed, we were inspired to try the Southern Living idea house’s gingham wall…we didn’t use quite as much glaze in one of the stripes..that is the key if you try it at home and want that transparent buffalo check look…glaze yall! 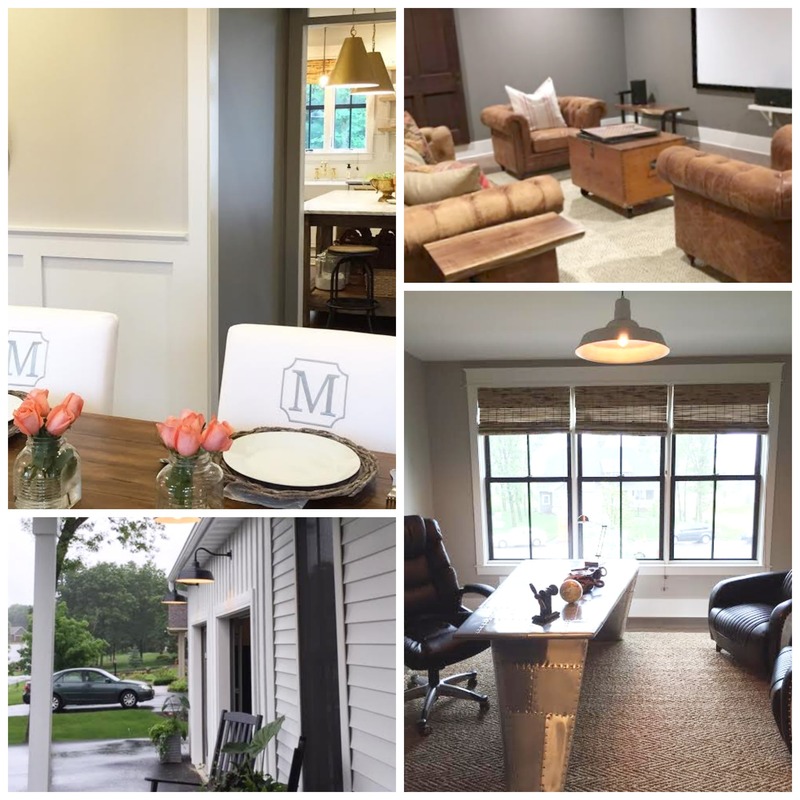 Main features of this house that I love and can be used in any new home to make it feel old: large baseboards, old door knobs and glass or black, glass transoms over doors, long leaf pine floors, shiplap and schoolhouse lights. And lighting with charm outside too! 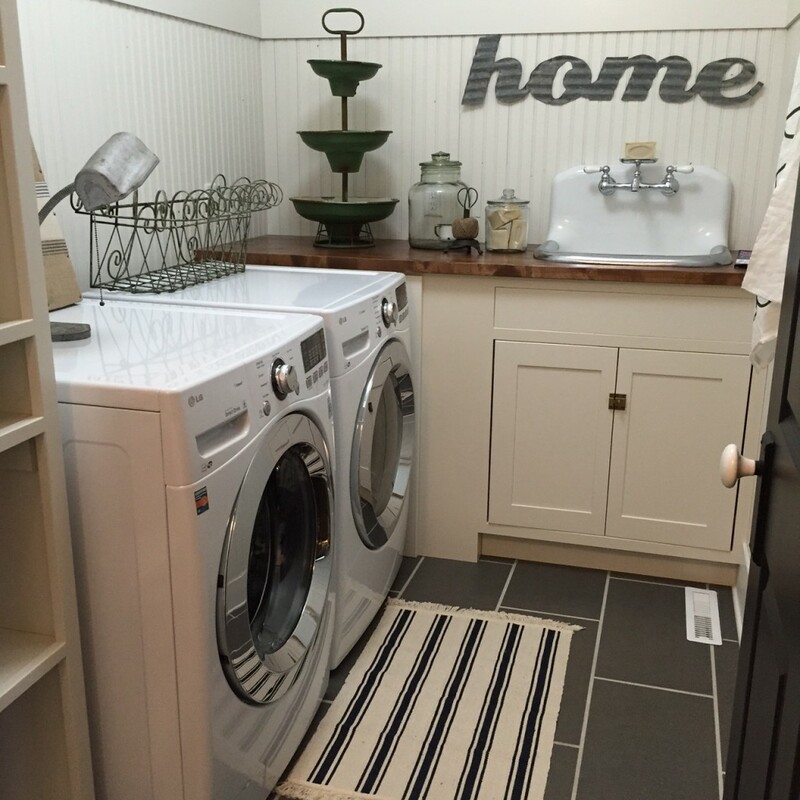 The laundry is not huge but very functional with cubbies and the old sink! and lots of beadboard and hooks …liked it evolved as an old home would! This house has a mix of old lights and new lights, none really match but it doesn’t matter and plays into the vintage feel. 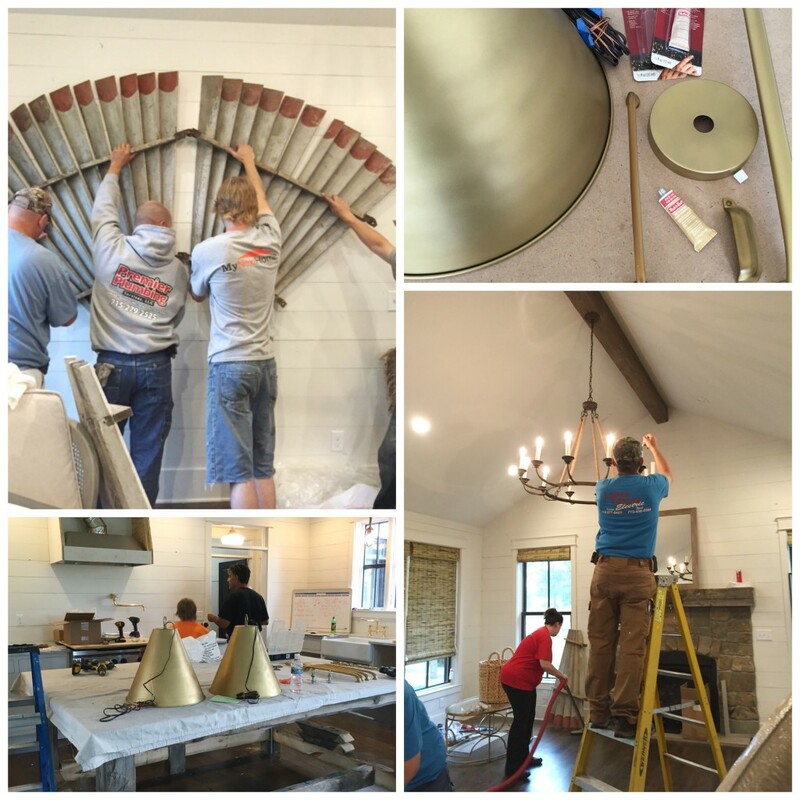 Some rooms have shiplap on walls and sheetrock on ceilings, other rooms the reverse! I love the black doors too! This view from the back hall into master is one of my faves! The ceilings are NOT super tall but the transoms play into that feel. 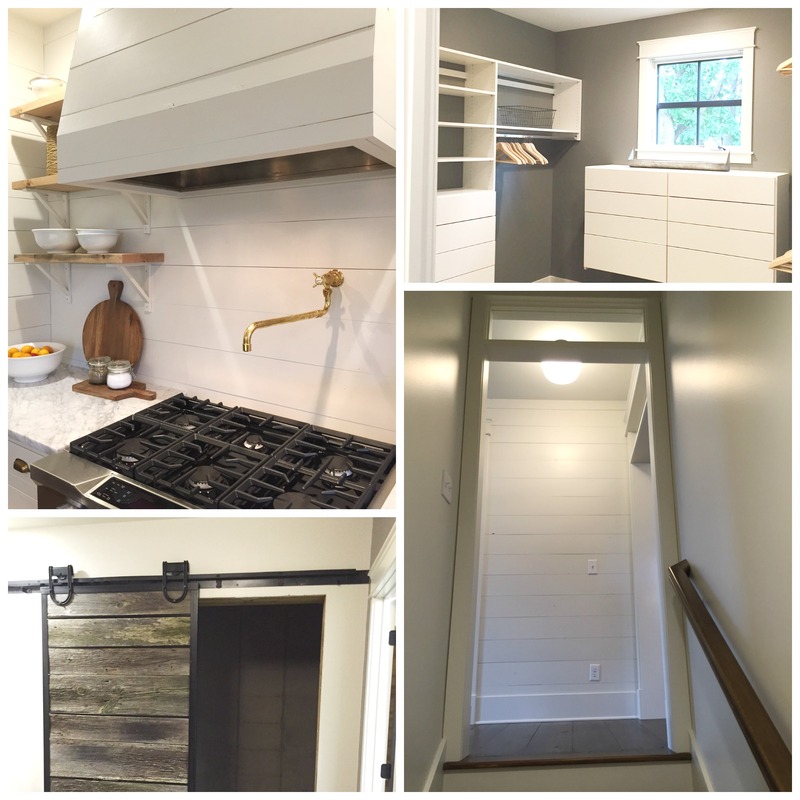 Shiplap on the kitchen hood…master closet is the lovely color SW French Gray…Allison has lived in an old house with no closets so long..this closet is going to blow her socks off once she moves in..so nice! 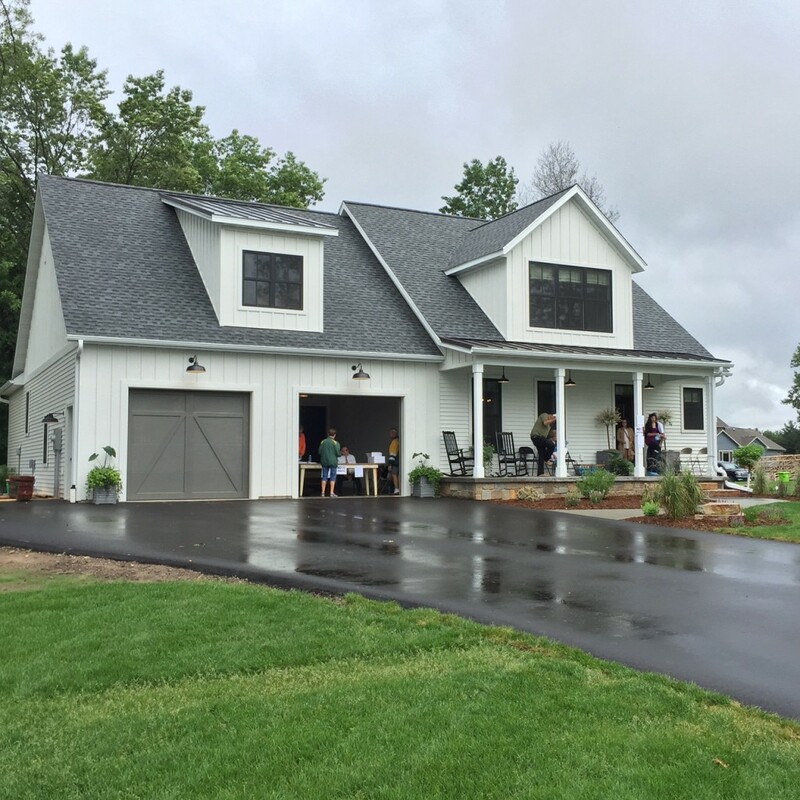 The basement has barn doors fashioned from barn wood from the family farm and a media room and more. And a view above coming up from the basement into main hall! The exterior is white vinyl siding, again practical. With metal windows that are black on outside and painted wood on inside..not steel! The homewoners asso would not approve an all metal roof so they just did metal for accents. 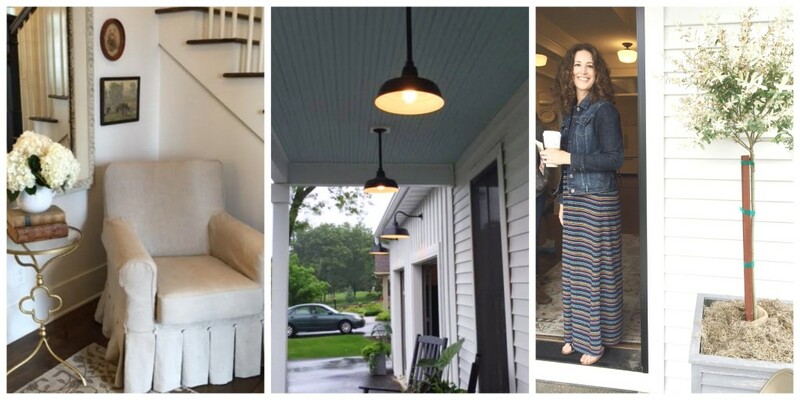 The haint blue porch ceiling (SW Watery) and the schoolhouse electric lights make the house sing in my opinion..my fave…the chelsea gray carriage looking doors for garage! Good job My NextHome and Allison Mills! This Texas girl had a great time with “you guys” and it was almost hard to leave especially the cool breeze. But I was glad to get back to this fella and his brother! Remember you can still visit the house today and tomorrow until 5! Visit here for more info on tickets! Holly, this home is amazing!! What color was the black trim and doors? This house is ah-maz-ing! I love everything! Exsp. The buffalo check walls! 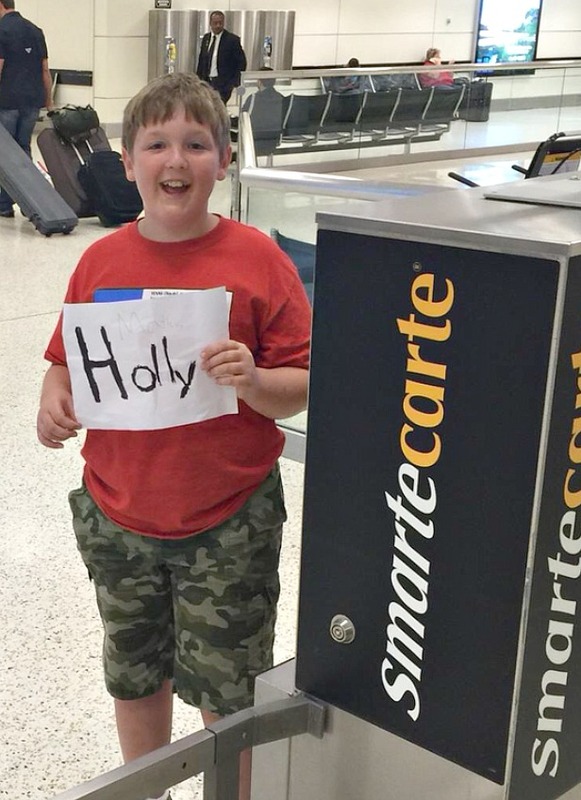 Well I laughed out loud at your cute son there waiting to pick you up! Precious! Now about that house…oh my goooodness at the gorgeousness. Suppose they would adopt me? Seriously a beautiful job in every room. Lots of work, but it had to be fun and fulfilling to have it done. This house is so beautiful, Holly! You are so talented! Your style feels classic and yet updated as well. I always look forward to your posts. Thank you for sharing your work. 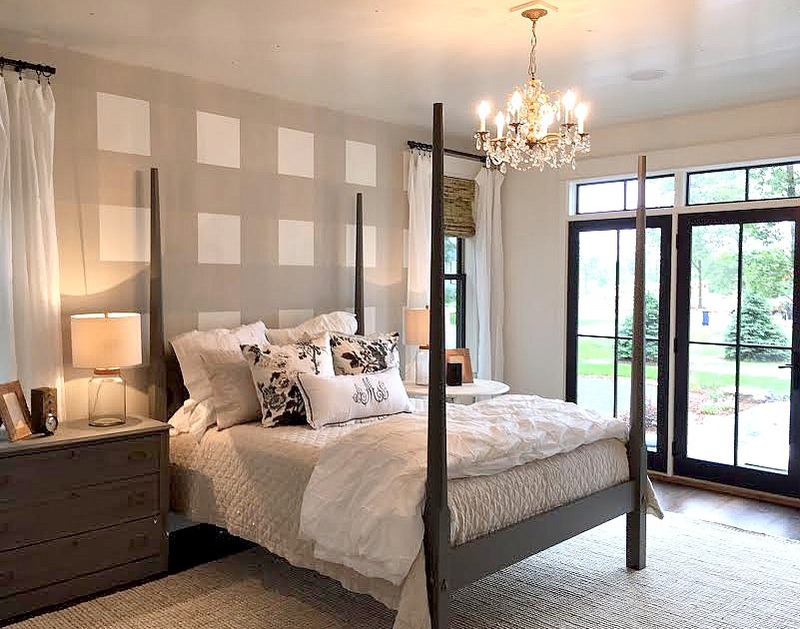 Um….yes to every bit of that house….and especially the Schumacher pillow fabric in the bedroom:) You rocked it Holly and you’re right…it is all about the mix! Great job! Extremely liveable and gorgeous! I love it…LOVE Holly Mathis style!!! Sigh. This is perfect! Start to finish perfect! 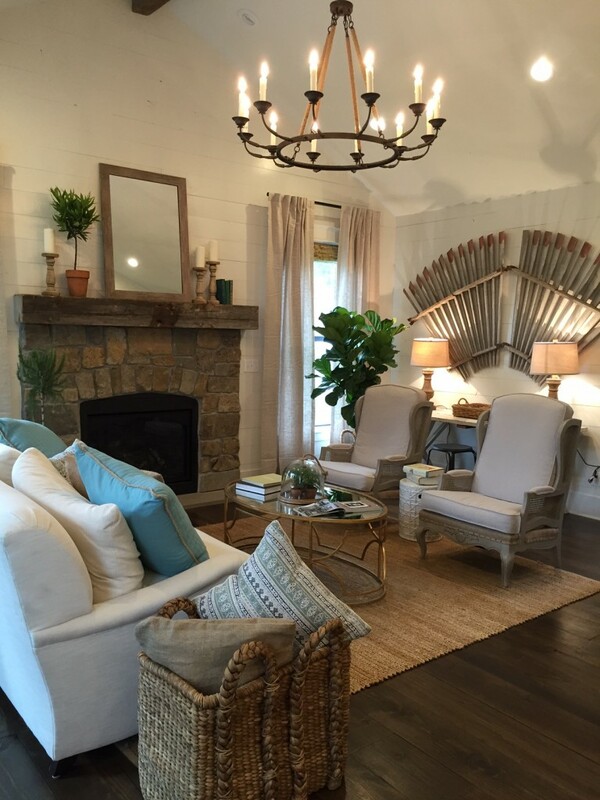 And I love, love, love that it’s a mix of big-box-buy-anywhere bones and custom accents. Great job, Holly!!! The house is amazing. I love all of the touches and details. Wish I was in the vicinity to tour. Wowsa! I think this is my favorite house ever! Love the inside and out!! Love EVERYTHING. Classic, cozy, and simple elegance. Great space. The home looks amazing. That island! Oh my! Want! How cute is Drew & his sign. Love it! Holly! I love everything you put your heart and hands into. You inspire me! I miss you! Would you mind letting me know where I could find the schoolhouse type pendant that can be seen in the picture with the transom window? 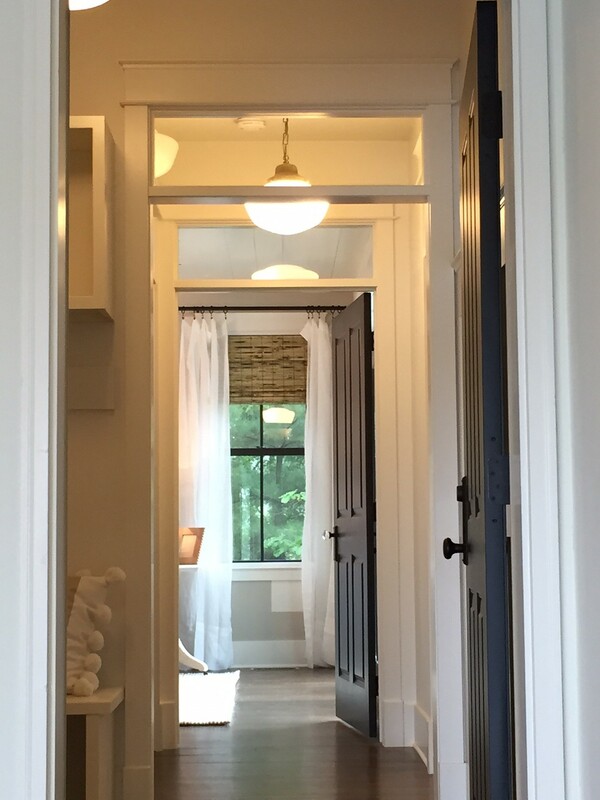 It appears to be a hall…looking for this type of fixture and this one appears a little different than the usual…maybe the chain it’s hanging from (as opposed to a rod)…thank you! What a beautiful house! Again, wonderful work!